This essay is included and first published in the recently released 2013 publication, National-Anarchism: Methodology and Application, edited by Troy Southgate and available from Black Front Press. 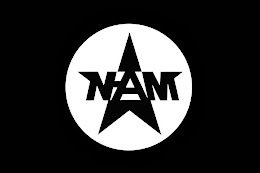 This article has stemmed from a question posed by an enquiring mind and the conversation that developed in response on the National-Anarchist Movement (N-AM) Facebook group . It was a reasonable question, for the only 'stupid' question is the one that is not asked, as long as it is posed in a respectful, civil and constructive manner, and one that arose due to the misunderstanding (either genuine or because of the lies spread by our detractors with an ulterior fascistic motive) of the National-Anarchist 'ideology'. That is, specifically, in regards to National-Anarchist communities and how they would relate to people of 'mixed heritage' and whether or not they would be accepted into an above mentioned community, or for that matter, which community they would be 'placed' into. 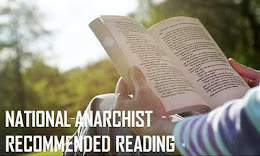 However, important as it is, this article will not limit itself to those solely of mixed ethnic background, but all manner of individual characteristics and how they would relate to acceptance within a National-Anarchist community. Some characteristics of the individual, whether relating to cultural, sexual orientation, gender, or by any number of distinctions, may not be mentioned due to the overwhelming number alone, but I trust the gist of what I am saying will be clearly understood nevertheless. I thought it a question that, as it rears its head every now and again, deserved to be put into article format for the benefit of others that may have similar questions, if only reiterating the points and various views made elsewhere by myself and others – a sort of bringing it all together in one place if you will. Yet, I do not claim this to be the final answer on the topic and welcome others to elaborate upon it if the desire is felt. 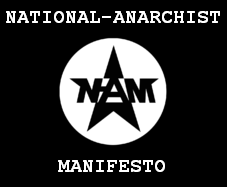 The first thing that needs to be pointed out is that National-Anarchism is for every race, and not the 'white race' or any one race alone (however you may define race) as is sometimes believed, and more-so that National-Anarchism has supporters of many racial, ethnic, cultural, and religious backgrounds, and from all over the world. Indeed, it must also be pointed out for those that are not familiar with National-Anarchism in general or from a non-hostile perspective, that there is far more to National-Anarchism than mere race! This can be seen by anyone with an open and unbiased mind with the willingness to learn the truth and not have their opinions subject to, and tainted by, smears – often by so called 'Anarchists' that have far more in common with fascists and that act like Nazi-Stormtroopers. This is often the case with dogmatic leftists stuck in their political cages, unable to view anything or anyone from outside of their own narrow minded and ideologically restrictive shackles. And, of course and not forgetting, the first port of call for many in the internet age with the significantly flawed and biased Wikipedia article. But as Voltaire is quoted as stating, “Our wretched species is so made that those who walk on the well-trodden path always throw stones at those who are showing a new road." And, I think, followed up nicely by Henry Louis Mencken when he stated, "Any man who afflicts the human race with ideas must be prepared to see them misunderstood." I once read an eloquent comment, so poignant in its avowal narrative contextually and directly, that regrettably it escapes me from whence it came or of its original form, that went something to the effect: There really must be a resilient viral strain, an endemic of psychosis in prodigious scope here in the western world, that makes it decidedly insurmountable for anyone to have such an imagination necessary to evaluate objectively anything at all from another context than their own. After-all, having the eyes to see and ears to hear mean absolutely nothing without a mind to think. As I have stated before, regardless of what you may or may not believe, nor how strong you hold on to whatever convictions you might have, it is an eternal truth that to hold a valid, intelligent, and educated opinion on any subject or matter, and to make any decision based on such, you need to always, and regardless of consequence, look at both sides of the story. Equally important is that you delve into any issue of debate or interest with an open and unbiased mind. This is, I am afraid, the only way to truly hold an informed and edified sentiment in any area, that is reasoned, rational and sophisticated and equally impartial, non partisan and realistically fair. Without such you can never hope to be taken seriously, by others, nor importantly I might add, by yourself. To have any hope of holding an educated opinion you need to listen to both sides of the story and then, and only then, can you truly decide for yourself on your stance in such a way as laid out above. You need to do research and one should always look at all angles from all possible roots in an open-minded manner, regardless of any particular area of study, without bias, prejudice or personal preference. This is the only way to get an unbiased and balanced point of view. That much is fact. The question of 'race' and the confusion over the term 'National' (and its alleged oxymoronic status when when linked to 'Anarchism') and various lies spread about the National-Anarchist Movement have been the subject of a number of articles and discussions , addressed and thoroughly refuted by writers far better than myself, because, as Mark Twain is credited as stating, "A lie can travel halfway around the world while the truth is still putting on its shoes." So, that need not be discussed here. However, that being said, the question of communities, race, and acceptance, does. 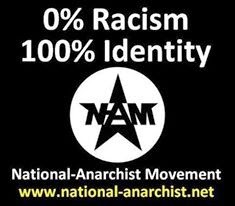 If one was Black, Asian, Jewish, White, or mixed, etc, racially speaking, would they be accepted into a National-Anarchist community? The short answer is yes, even if that community has to be started by that person, or persons, themselves. By extension, if one was homosexual, Muslim, Christian, Odinist, environmentalist, vegan, etc, they too would be accepted into a community, even, as I have stated above, that community has to be started by that person, or persons, themselves. Having said that, they may also be accepted into another already existing community, and one that isn't formed on the basis of homogeneity - racially, religiously, or culturally speaking. Like I said, the short answer is yes, but there are also many a letter between the Alpha and Omega, metaphorically speaking. And, to illustrate this, that is ultimately up to the parties involved themselves to decide, freely, and respectfully. At the end of the day, whatever community accepts you, and you agree to their standard of living and operating, is that which you are a part. The key to understanding this concept of communities within a National-Anarchist framework, is that of non-coercion, free-association, and mutual respect. But also not forgetting autonomy and decentralisation from the state. And, it needs to be made perfectly clear that there is no vision or secret plan for an all-powerful oligarchy that will decide and force people into certain groups and areas like pawns on a chessboard. Indeed, that would go against the very concept of Anarchism itself. Anyone thinking that has a fundamental misunderstanding of National-Anarchism in general, and Anarchism overall. Village-communities will spring up based on whatever criteria those involved agree upon (as I have pointed out is already happening in another article ), whether it be any of the above or otherwise. We certainly do not wish to place anyone, individual or group, into any assemblage whatsoever – that would be so far from the truth and reality of National-Anarchism that that opinion would be like a dot to us on the proverbial horizon. It must be made clear, that association is the sole responsibility of each individual to decide for themselves who they wish to affiliate with, and conversely, the decision of the existing group as to who they wish to let into their tribal village-community. For example, and for arguments sake, I am white, and I come across an already existing National-Anarchist community that is based upon Odinic principles, spiritually speaking. That community may be based on spirituality alone, or also incorporate racial separatism into the mix, or not as the case may be. Now, I am an Odinist anyway and the community accept me, but I may not agree with the fact that they are racially separatist or that they are not vegan like I am. So, what then? 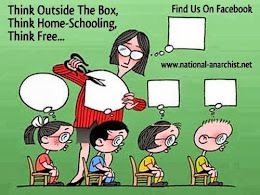 Well, it is rather simple when looked at from an Anarchist perspective, based upon 'non-coercion, free-association, and mutual respect', or common sense for that matter. That is a community that developed with a group of individuals with shared opinions, and ideologies, that are not interested in what anyone else is doing as long as it doesn't affect them and they don't force anything upon anyone else. It was created entirely out of mutual understanding and agreement, so I either accept their stance, or move on. Now, I can either find a group of others that share my view of a community or I can form one myself, or work on my own for that matter. But like I say, it is down to, and I stress again, non-coercion, free-association, and mutual respect. It is actually very simple when you look at it. For me to come into a group, that has come together and mutually agreed upon what they want their community to consist of or ideals based upon, and start saying that they're wrong, or things should be done differently, or that we should exclude homosexuals (if that existing group welcomes them or is a homosexual community to begin with), or we should only consume vegan food, or that my way works best, is rather fascist in and of itself, and unless it was a respectful discussion in which we all came together to discuss freely, and I accepted the outcome, I'd rather be acting, for fear of repeating myself, like a Nazi-Stormtrooper. Tribes or groups, whichever term you prefer, may have any number of criteria as to how their communities are formed and to what extent they are ultimately based upon. 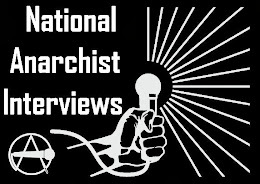 Yes, some may use race or ethnicity as a separator, and race is a reality to National-Anarchists, but race is not the be all and end all of National-Anarchism, and National-Anarchism extends far beyond such limitations, and into many diverse, yet interconnected areas, as the Manifesto makes apparent. This makes perfectly clear, and is obvious to me at least, that there is simply not just a singular ideal for a National-Anarchist community, but room for any number of them based upon whatever criteria is chosen by those involved. 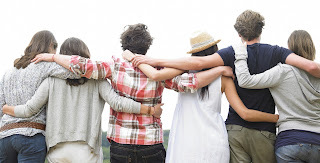 Race, religion, spirituality, culture, ethnicity, heritage, sexual-orientation, etc, are only some of the components with which different individuals and various groups will choose to come together on in a mutually agreed manner and form a village-community or autonomous-zone out of such cooperatively. And, of course, as there are now already within the National-Anarchist Movement, groups active that are not based on any of the above, where all are free and welcome to join. But that is the key thing... freedom - the freedom to choose and to associate with whomever you wish, so long as you don't force your opinions and requirements upon others, and equally, others don't force their feelings, persuasions, and sentiments upon you. It is very much live and let live as the saying goes. This ultimately leads to pure and true self-determination and individual autonomy, for those that can mutually cooperate upon whatever criteria they choose, either within the community, or two separate communities based on differing criteria being cooperative and respectful with each other. If you want to live within a black separatist, homosexual, or raw-food diet only enclave, then so be it! If you want to subsist within a mono-racial or multi-racial community then good for you! If you want to have cohabitation within a naturalist environment with like minded people, then go for it! Any combination of the above or more? Then knock yourself out! The possibilities are endless as long as it is freely and mutually agreed upon. Others should respect you for that and not bother you unless you mutually agree to cooperate for whatever reason, and equally, those separate groups should not bother each other, unless as I state, you mutually agree to cooperate. The point is that autonomy of the individual is paramount, and each person has the unalienable right to associate freely with anyone he or she chooses and sees fit, or, of course, with no-one at all. As should be apparent by now, National-Anarchism itself doesn't set the boundaries by which communities are made or in any way that individuals should associate, but the communities of individuals themselves set the markers for how they wish to live, freely, and without interference. Ultimately, the individual nor the group should tell any other individual or group how to live or how to think, so long as each individual or group actions do not impede those of others. Of course, there are those that enjoy multiculturalism that are not of mixed race, and there are those that are, and that is absolutely fine. What is more, as I have tried to express, is that if a community based upon this is wanted, then so be it, as long as it is voluntary. But, conversely, if there are those that want a community also but are not interested in multiculturalism, then this is fine also, and what is there to stop them cooperating? And, even if they don't want to cooperate and want to be entirely separatist, then this is perfectly fine also. It is all about freedom and respect. I fail to see why anyone would think hate would come into it, that is totally nonsensical. Of course, there are those that hate, but they would have no place within the National-Anarchist Movement. But for those interested in looking deeper, you will find that race is only one element of National-Anarchism, but sadly for some, it means removing their blinkers to see as much. The childish shouting of the nasty little smear words 'Nazi' or 'Fascist' at us (in effect used to frighten others from talking to us and taint their opinions), rather than engaging in debate in a respectful and constructive manner, is the last line of defence for those without an argument or the ability to converse in a civil way. As Samuel Adams has said, “Mankind are governed more by their feelings than by reason.” These people are not Anarchists, and nor are they shining examples of the humanity they claim to be a part of and astonishingly, represent. 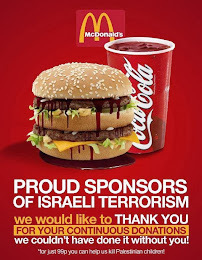 They can be seen for what they truly are, hate-filled fascists and puppets of the state, whether they know it or not. Much of it is projection, coupled with their inability to participate in polite dialogue. Labels simply do not have any meaning these days, and using them as smears in some adolescent way to somehow silence someone either shows that person’s lack of understanding of the terms real meaning and association or their complete inability, as mentioned, of being able to hold their own in the civil and respectful conversational manner. Only the immature and foolish mock and scorn that which they have absolutely no knowledge or understanding, nor indeed for that matter, the intellect to grasp such given the opportunity to do so. Mediocrity of the mind, no matter how well one tries to conceal it, will always reveal itself to be as such. Of course, not everyone that childishly disagrees with you is simply not understanding the self evident and logical, but it is on purpose and with an ulterior agenda. Having said that, I fully acknowledge and agree that there are going to be those with genuine questions, and to those we are more than willing to explain and take any and all criticism, and take the time to converse. One thing is for sure, is that we will give far more respect, civility and constructive discussion to those that wish to silence us, than they give us. I write these words in response to the sick and rotten root of defamatory accusation that will, when nurtured, grow and spread its disease like an incurable cancer, watered and loved by those with fragmentary circumstantial beliefs, vindictive mindsets, and simple and hateful yet ill-conceived agendas. But, ever the ready gardener will rise above such mediocrity of mind and look to his blessings with honour, respect and decency and move forward with pride and honesty in his heart. Indeed, who am I to tell others how to live and who to associate with? I certainly wouldn't be an anarchist if I did, more-so a fascist dressed in anarchist clothing. Which, oddly, is what I have come to discover many of the dogmatic leftist 'anarchists' are, fascists in anarchist clothing. Let it be said, we as National-Anarchists are above the fascism and dogmatism of the right, and beyond the dogmatism and fascism of the left. 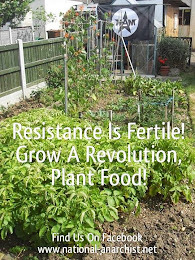 This movement encourages liberty, justice, autonomy, agorism, self-sufficiency, trade, bartering, environmental deference, non-coercion, free-association, mutual respect and cooperation, and the freedom from interference from the state. Ultimately, it sets you on the path to self-determination and true freedom. But you need to take the first step! I would like to express my sincere gratitude to Josh Bates, Justin Gillespie, Nathan Wild, and Troy Southgate, for without their valued input and inspiration, I may never have decided to put this article together in the first place, which with respect, incorporates some of their openly expressed opinions, some in paraphrase, that, as a National-Anarchist, I wholeheartedly share. * The BF Debates here or alternatively here.